Green-light time on a pair of robot-tended press brakes averages 40 percent higher than on manually tended brakes at contract sheetmetal fabricator Metal Works, Inc., Londonderry, NH. 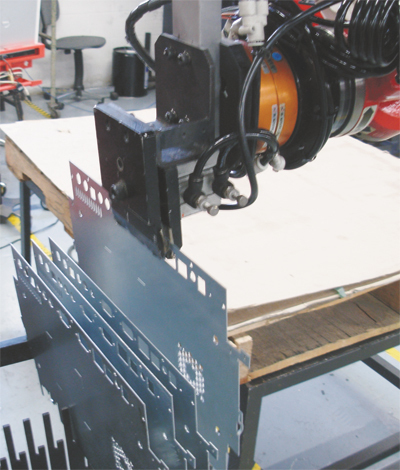 Forming enclosures for Suntron and ZeeVee at a Metal Works’ robotic bending cell begins with a robot pulling a blank—prefabricated on a turret press—from a rack and placing it against automated backgauges in a press brake. The firm provides full-service support to hundreds of customers, including engineering, prototyping, machining, painting and powder coating, assembly and custom inventory-management programs. When a bottleneck struck its press-brake forming department about four years ago, an investment in robotic technology saved the day. As a result, Pierce opted to add a pair of Amada 10-ft.110-ton Astro II 100NT robotic forming cells to his stable. The automated forming cells, says Pierce, completely integrate what he viewed as two separate functions—a press brake that goes down and up, and robots that feed sheet in and out and position parts against multiaxis backgauges. Now, the two automated bending cells typically run 1.5 shifts/day, under the guidance of one operator who also assumes responsibility for offline programming. Programming is performed on the shop floor using a laptop computer on a roll-around cart, equipped with Amada’s Dr. Abe automated bending-expert programming software. Pierce is pushing hard to have as many programs developed as possible to run work on his two automated cells. While the ideal parts routed to the automated cells are the more bend-intensive ones, with six or more bends, there are efficiencies to be gained with just about every job requiring press-brake work, says Pierce. As such, Pierce says at least four or five bending jobs get programmed for the robotic cells each week. High-mix small-lot production, it turns out, is exactly what the Astro II 100NT is configured for, with remarkably fast backgauge motion (80 mm/min.) and two robots working in concert to move material in and out of the cell, while positioning parts against the backgauges in sequence. The press brakes are 110-ton HDS-1030NT models with 122.4-in. bending length and 7.9-in. stroke. The robots? They’re five-axis models with 44-lb. weight capacity capable of handling blanks to 31.5 by 39 in. (or 11.8 by 70.9 in.). 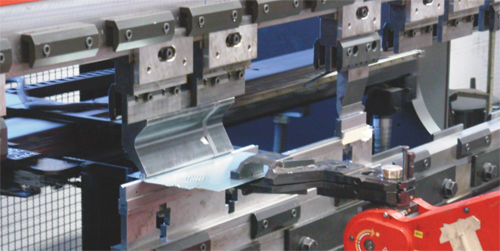 Compared to manual press-brake tending, productivity and quality can rise significantly. 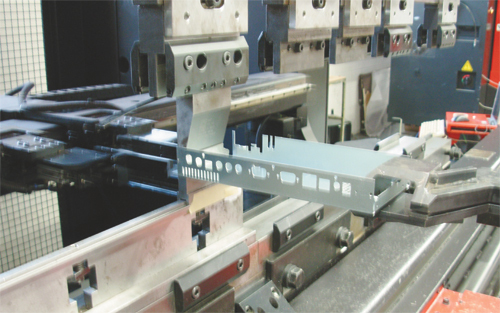 To explain, Pierce describes for us one particular project where costs were minimized enough to convince a U.S.-based OEM customer—ZeeVee, a manufacturer of high-definition video-distribution equipment—to bring the sheetmetal-fabrication work back from China. Based in Littleton, MA, ZeeVee launched manufacturing operations in 2007 in China, believing that “U.S. manufacturers couldn’t adequately support their business model,” according to a recent article in Circuits Assembly magazine. When its market shifted noticeably from consumer to commercial, China’s aptitude for large batch-oriented production “limited ZeeVee’s agility, making it difficult to implement a continuous quality improvement process or introduce product variations,” the article notes. As issues over shipping logistics and inventory control grew worrisome, reshoring production with U.S. partners began to look more attractive to ZeeVee management. Finally, early in 2011 the firm contracted Methuen, MA-based Suntron to manufacture its products. Suntron’s supplier of fabricated sheetmetal enclosures: Metal Works, Inc.
Metal Works launched production for Suntron in October 2011, and Pierce expects to support ZeeVee’s growing business with production runs in batches of 1000 to 2000 every few weeks. The enclosures measure roughly 18 by 24 in., fabricated from 18-gauge mild-steel sheet that arrives at Metal Works in 4- by 8-ft. blanks. Turret presses prefab the blanks, adding lances, slots, holes and extruded and tapped holes, which then move to the Astro II 100NTs.